Capture your toddler’s attention through vibrant pictures and short rhyming verse with this adorable little book. 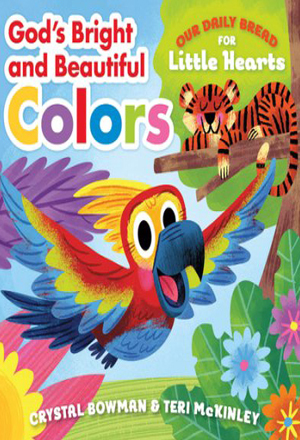 Our Daily Bread for Little Hearts: God’s Bright and Beautiful Colors introduces children to God as Creator of the great big world, while highlighting some of the bright and beautiful things in it. Kids will enjoy exploring the world around them, the big BLUE sky and warm YELLOW sun, the large GREEN leaves and sweet PURPLE grapes, and other colors that appear in God’s creation.